You are here: Home / Editorial / How Much Sugar is in Popular Drinks? It seems EVERYTHING has added sugars nowadays. From salad dressings to pasta sauces to previously-healthy vegetables. Added sugars are everywhere. It’s easy to spot these sugars in cookies, candies and ice cream, but food companies subtly add sugars to many foods that may surprise you. 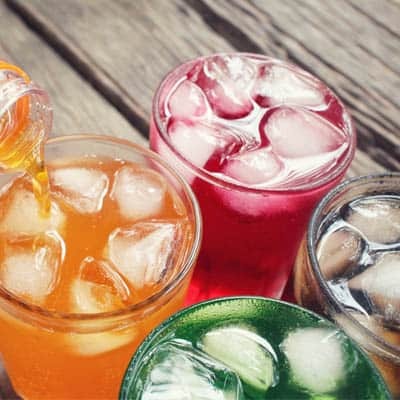 This article will investigate the carbohydrate and sugar content of popular beverages….. check and see if your favorite is in this list! EVERYONE knows that soda pop has a lot of sugar, right? But, do you realize how much? It may be easy to rationalize that an occasional cola or root beer is all right. Let’s look at the facts. One 12-oz can of cola contains 136 calories, 35 grams of carbohydrate, with 32 grams of added sugar. That is 8 teaspoons of added white sugar! Think that the clear sodas are healthier? Think again. One 12-oz can of fruit-flavored soft drink contains 148 calories, 38 grams of carbohydrate, with 32 grams of added sugar. Root beer is even higher with 152 calories, 39 grams of carbohydrate and 37 grams of added sugar. Do your glucose a favor and completely discard sodas from your diet. While it is true that there are several health benefits of drinking tea, the pre-packaged bottled teas are not doing your glycemic control any favors. 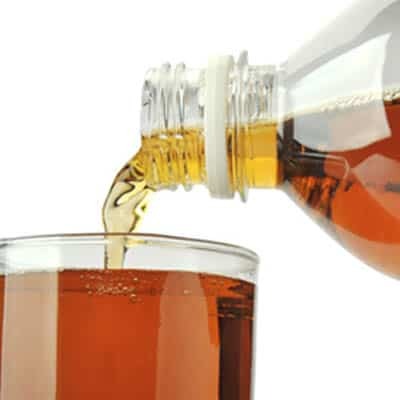 One 20-oz bottle of sweet tea includes 200 calories and 58 grams of carbohydrate, with ALL of that from added sugars. Since most diabetes experts recommend 60 grams of total carbohydrate per meal, one bottle of tea makes up an entire meals-worth of carbs. If you are considering green tea as a healthier alternative, consider that one 20-oz bottle of green tea contains 120 calories and 33 grams of simple sugar carbohydrate. Not much better, truthfully. Arnold Palmer drinks, half lemonade and half iced tea, are no better either – 120 calories and 31 grams of carbohydrate (all sugar) in a 20-oz bottle. There are new canned “sparkling tea” drinks, but they also contain 70 calories and 18 grams of carbohydrate (all sugar). Do your body a favor and skip the pre-prepared tea drinks…. Brew your own and enjoy the natural flavors, free of additional sugar. 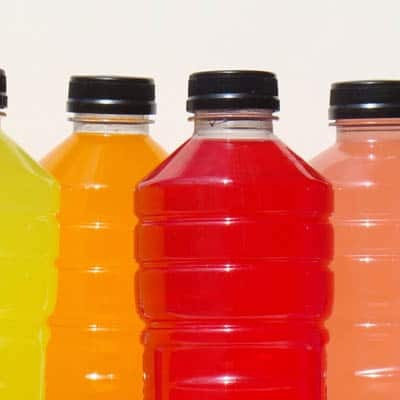 Unless you are a professional athlete, or are rigorously training for an event, it is highly unlikely that you need the electrolyte and sugar replacement provided in popular sports drinks. Check out the comparison of the most popular brands in the table below. Use this data to make wiser choices! Yes, they have been all the rage for years now…. 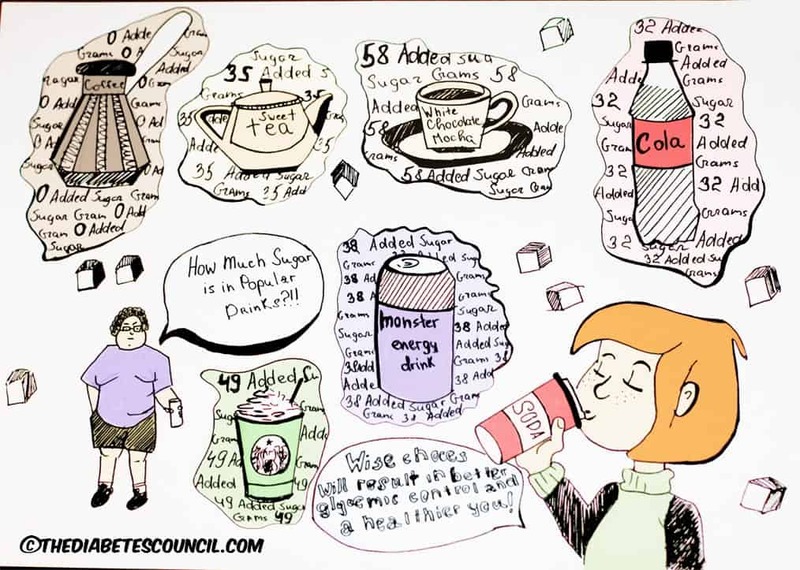 But, some coffee drinks are higher in carbs and added sugars than regular soda pop! 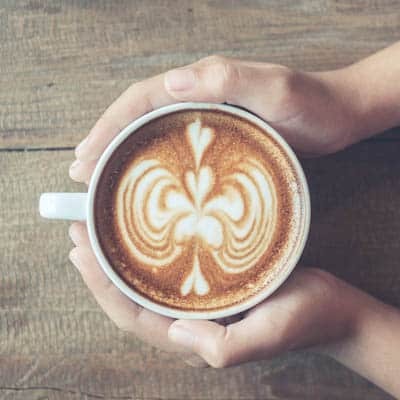 Check this out – a 16-oz cappuccino contains 120 calories with 12 grams of carbohydrate. A 16-oz latte contains 190 calories with 18 grams of carbohydrate. A 16-oz mocha contains 360 calories with 44 grams of carbohydrate. Flavored lattes can contain between 330-440 calories with 40-70 grams of carbohydrate. Yikes! And, don’t believe that those fancy, whipped, cold, icy coffee drinks are healthier just because they come out of a blender…. They can range from 410-480 calories with up to 79 grams of carbohydrate! That is nearly 20 teaspoons of white sugar OR almost ½-cup! On the bright side, if you love black specialty roasted coffee, you are consuming only 5 calories and zero carbs. Even if you add in a touch of sweetener or regular sugar and cream, you will never reach the levels of the coffee drinks described above. Everyone needs more get-up-and-go these days, and many young folks are turning to the caffeine-laced, sugar-laden energy drinks promising vigor to get through the day. One 20-oz can typically contains between 220-280 calories, 54-62 grams of carbohydrate, nearly all of which is from added sugars. One meal in a can! Certainly not the healthiest choice of carbohydrate. 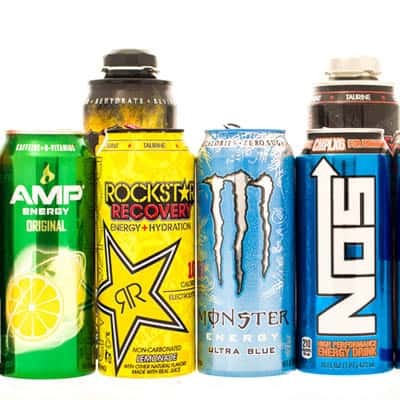 Several brands of energy drinks offer low-carb or sugar-free options. Keep in mind these still provide a small amount of carbohydrate – ranging from 3-7 grams per 20-oz can. A definite improvement, but these carbs still should be included in your carb count for the meal. What could be healthier than pureed fruit in a bottle? Of course, fruit has many health benefits such as vitamins, minerals and fiber. The companies that sell these bottled smoothies generally promote their products with misleading claims on the containers – so, be sure to read the Nutrition Facts labels carefully. Remember that all carbohydrate needs to be counted when you have diabetes and are aiming for optimal glucose control. 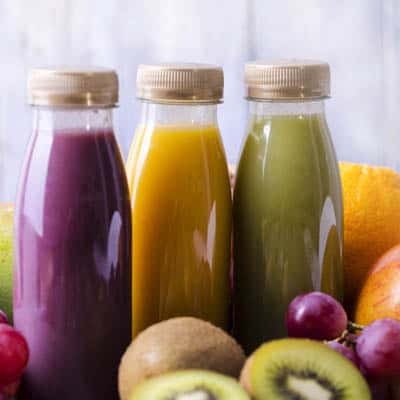 15-oz bottles of fruit smoothies contain between 200-400 calories and 40-80 grams of carbohydrate. Even the varieties that mix lower carb vegetables with the fruits are high – 190-270 calories with 40-63 grams of carbohydrate. To enjoy these beverages, make your own at home and keep track of the ingredients so that you can adjust the carb content to meet your needs. In summary, be smart about your beverage choices. One wise healthcare professional once said, “It is much more satisfying to CHEW your calories than simply DRINK them.” Make your carbohydrate grams count by including satisfying, filling, nutrient-packed foods instead of sugar-dense drinks. Wise choices will result in better glycemic control and a healthier you! I hope this article helped you with managing sugar in your diet. I am doing my best to cut all simple carbs from my diet, and rightly so, as I am facing bypass surgery in a few weeks! So, looking over the cases of beverages at coo Costco I inadvertanly picked up a case of ‘Vitamin Water’ without reading the entire label (my bad) and wondered why my glucous levels were going up…I reread the label and found 33 grams of carbs, 32 of them SUGAR!! Up in the same range as a regular pop drink!!! How deceptive these drinks are making it look healthy, I am so mad! Yeah, my friend and I were at a bagel store on the coast of Maine yesterday and, just out of curiosity, began to read the labels of the juices, sodas, and drinks in the store’s cooler. Nantucket Necter’s GrapeAde had 66 grams of sugar. Think of that as sugar cubes (@3 grams of sugar per cube) and you’d essentially be drinking a 16 oz of flavored water with 21 sugar cubes!!! Their apple juice has 50 grams of sugar. No wonder we’re a nation of sugar addicts and diabetics. Small point of note, the real brewed teas, I’ll use pure leaf as an example because I love it, the unsweetened is 0 sugar 0 carbs. is it okay to use Sugar In The Raw as a sugar replacement?? ?